A factually dense rebuke to (mostly white) liberals who “choose a colorblind vision” of politics, arguing that American society’s ingrained racism requires effective race-centered policymaking. Building on a lecture series at Harvard Law, legal scholars Guinier (Who’s Qualified?, p. 642, etc.) and Torres (Law/Univ. of Texas) invite the public to consider, among other indicators, the plight of young black men, long the primary targets of racial profiling on the part of law-enforcement agencies. These young men, they write, are the social equivalent of “miners’ canaries,” serving as early warnings of poisonous social relations. 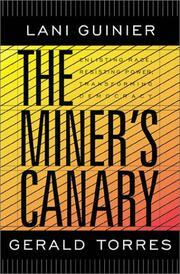 “The canary,” they observe, “is a source of information for all those who care about the atmosphere in the mines—and a source of motivation for changing the mines to make them safer.” Though the miner-canary metaphor comes in for a thorough stretching and is invoked, it seems, every page or two, and though the authors’ program for countering racism involves no small measure of wishful thinking, their description of current race relations is well grounded, often even inarguable. Guinier and Torres observe that society in general seems to have decided that the best place for those young black men, for example, is prison: “In the United States,” they note, “if young men are not tracked to college and they are black or brown, we wait for their boredom, desperation, or sense of uselessness to catch up with them. We wait, in other words, for them to give us an excuse to send them to prison.” Those who insist that American courts dispense justice equally get a stern lesson with statistics the authors cite to the contrary, while civil-rights activists will find much to motivate them in the authors’ prescriptions, which include grassroots political organizing, consensus-building, “enlisting race to resist hierarchy,” and other measures. A useful, provocative, wounded critique of the status quo.